Three companies that have consistently outperformed the market -- and expectations -- with outsized returns. Slow and steady wins the race. That old saw provides the foundation for successfully building a retirement-worthy portfolio of profitable, high-quality companies. 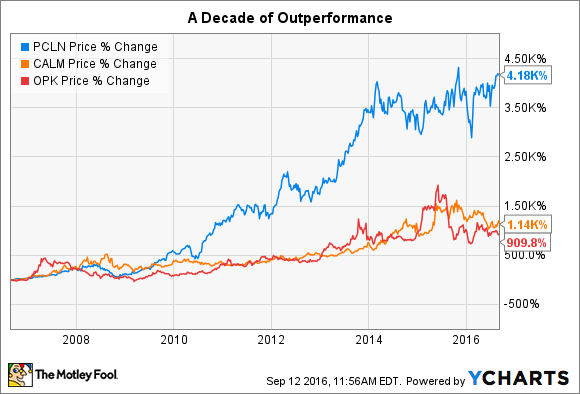 To get an idea of what was possible, I pored over a long list of companies looking for those that have not only achieved market-beating performances over the past decade, but ought to be able to provide outsized returns in the future as well. Read on to find out the three stocks that turned a $5,000 investment into $50,000 or more in 10 years' time, and which investors should have confidence in continuing to do so. Founded on the idea of letting passengers name the price they would be willing to pay airlines for tickets, Priceline Group (NASDAQ:BKNG) has become the global leader in reservation services that has since expanded to include hotels, rental cars, and restaurants. Although it attempted introducing the concept to other services, such as new cars and home mortgages, ideas that failed to catch on, over the past 10 years Priceline has still returned 3,743% for shareholders, turning a $5,000 investment into more than $187,000. Just recently, Priceline announced that it was doing away with the name-your-own price for plane tickets, as changes in the airline industry made less inventory available for the service. You can still name your price for hotels and car rentals. Despite the demise of the revolutionary product, which changed how consumers booked travel, it represented a declining portion of its worldwide revenue. Although it's had its share of troubles recently, including the ouster of its CEO for an inappropriate relationship with a subordinate, Q2 earnings indicate why Priceline will keep generating high returns for investors: Revenue and EPS jumped 12% from the year-ago period as gross bookings climbed 19% and hotel-room nights surged 24%. More travel opportunities in Europe and Asia, particularly in China, ought to see Priceline book more revenue and profit growth in the years ahead. As the largest producer and marketer of shell eggs in the U.S., Cal-Maine Foods (NASDAQ:CALM) has benefited from consumers' love affair with this simple source of protein. As a supplier to big-box stores such as Wal-Mart (NYSE:WMT), which accounts for 29% of its sales, and national grocery store chains, it provides them with traditional shell eggs, but also specialty egg products that it classifies as "nutritionally enhanced, cage-free, organic, and brown eggs." Cal-Maine has returned 1,211% in the past decade that would have become $60,000 had someone put a modest $5,000 investment into it back in 2006. Specialty eggs are a growing business for Cal-Maine Foods and represented 29% of revenues last year, but as more stores and restaurants begin committing to going cage-free for the eggs they either sell or use, it will become an even greater part of its business. Wal-Mart and McDonald's, for example, have promised to be 100% cage-free by 2025; others, such as Taco Bell, plan to do so immediately. As specialty eggs carry high price points because of their perceived higher value, Cal-Maine Foods should see greater value added to its own stock in the future. Opko Health (NASDAQ:OPK) has grown over the years through acquisition, either with innovative products such as Rayaldee, which it acquired the rights to several years ago and for which it just got FDA approval, or through other companies themselves, such as Bio-Reference Labs, the third largest clinical laboratory in the country. That's been a successful strategy for investors, as its stock has generated returns of 1,119%, turning $5,000 into almost $56,000 in just 10 years. CEO Phillip Frost has a proven ability to generate returns through M&A activity, but it could be Opko's pharmaceuticals are what drives it forward. Rayaldee, for example, could be a lucrative new source of revenue if doctors prescribe it to the 9 million patients diagnosed with stage 3 or stage 4 chronic kidney disease who suffer from vitamin D insufficiency. Similarly, its Varubi won FDA approval late last year and phase 3 data for hGH-CTP is on deck later this year. Opko also markets the prostate cancer screening test 4Kscore. There are obvious risks to each of these opportunities -- other treatments are available, doctors may not prescribe, additional approvals may not be granted -- but Frost's record of success indicates he won't be sitting still waiting for chances to come to him. Instead, he'll be out there pursuing the next big score.